In-house Specialist Orthodontist Dr. Emer O’ Leary BDS NUI, MFDS RCS(Glasg), MOrth RCS (Edin), D.Clin Dent Orthodontics (Glasg) is a member of the Orthodontic Society of Ireland (OSI) and is also listed as a Specialist Orthodontist on the Dental Council’s Specialist Register in the Division of Orthodontics. She is also a member of the Irish Dental Association. Dr. Emer O’Leary completed her dental degree in University College Cork in 2005. Following graduation, Dr. O’Leary worked in general practice in Scotland and Australia followed by SHO positions in a wide range of specialities such as paediatrics and oral surgery. She completed her MFDS exam in the Royal College of Surgeons of Glasgow before undertaking a three year orthodontic training programme in Glasgow. She graduated with a Doctorate of Clinical Dentistry in Orthodontics with merit and completed the Royal College of Surgeons of Edinburgh professional membership exam. Dr. O’Leary offers a complete range of orthodontic treatments for all age groups including Invisalign™ (as seen of TV3’s Celebrity Apprentice), white ceramic braces and short course treatments. An orthodontist has spent three further years on a full-time specialist training programme studying and implementing methods to straighten teeth and as result is very highly skilled in creating your perfect smile. This means that you will receive the best treatment possible. Typically how long does the treatment take? Treatment times vary from about 6-24 months. Simple straightening can often be carried out as quickly as 6 months, particularly if it’s only the front 6 teeth. Timing depends on the severity of the problem and what the patient desires of the treatment. Our in house orthodontist will be able to advise you at your free consult the estimated treatment time. We realise that Orthodontic treatment is more expensive than other dental procedures and as such interest free payment plans are available – we will sit down with you and discuss what payment plan best suits your budget. Dr. Curtin, clinic principal, is currently undergoing orthodontic treatment carried out by Dr. O’ Leary – see if you can spot the Invisalign™ appliance in her mouth the next time you are visiting the clinic!! 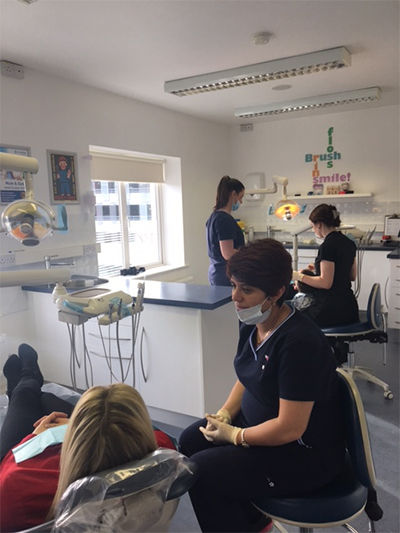 At Corabbey Dental & Orthodontics we have gone to great effort to ensure all Dentists and Specialists have undergone training at the best universities and are registered on the Dental Register and Specialist Dental register as appropriate.